This message carries a warm greeting and the gratitude of the Human Rights Committee of Puerto Rico for your constant support and work in the struggle for the release of Oscar López Rivera. June 20, 2016 will mark a new series of events before the United Nations Decolonization Committee in New York to demand that the colonial case of Puerto Rico be examined by the General Assembly and a true decolonization process for our homeland be initiated. 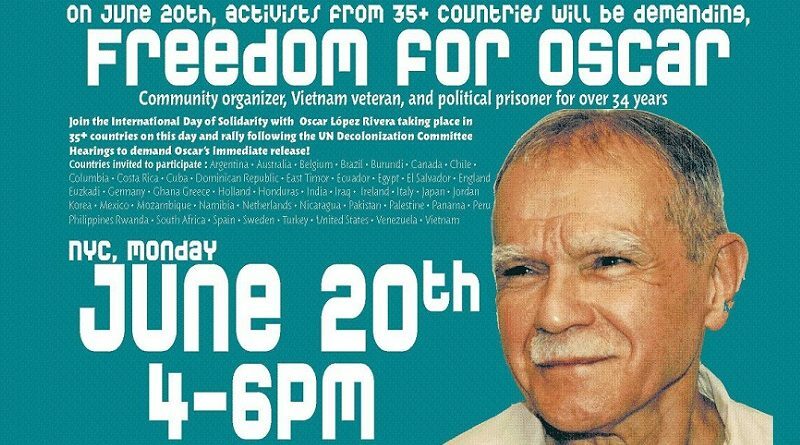 We invite you, in support the release of political prisoner Oscar López Rivera, to contact the countries of the world which, as members of the United Nations, defend human rights and self-determination of the people, as well as the fundamental statutes of the United Nations. Our purpose is that peaceful activities be carried out in 35 countries (one for each year of Oscar’s imprisonment) in an exercise of freedom of expression and demand for redress before United States entities. This will make known world support for Oscar’s release. We extend our gratitude for your efforts in order that this clear expression of human solidarity with political prisoner Oscar Rivera be heard loud and clear throughout the world. ← End the system that perpetuates homophobia, biphobia and transphobia!